The Falcon's Nest is situated in the centre of Port Erin, on the south west coast of the Isle overlooking a beautiful, sheltered, sandy habour beach. The hotel is ideal for families, walking groups, golfers, railway enthusiasts and for the business traveller only 10 minutes from the airport and 30 mins from Douglas. As a family run concern the Falcon's Nest Hotel provides comfort and a relaxing atmosphere with superb quality service and cuisine to suit the most discerning visitor. The warm and welcoming ambience of the Falcon's Nest, combined with it's friendly and efficient service make the hotel a most appealing residence for a vacation on the Isle of Man. 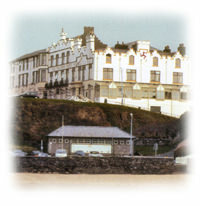 The hotel has 37 en-suite bedrooms and seaviews available. All rooms are designed with your comfort in mind and offering many facilities. The hotel is perhaps best know for its cuisine and has an a la carte restaurant, carvery and functions suite. Meals and snacks are available in the two public bars, serving real ales and an extensive range of whiskies.